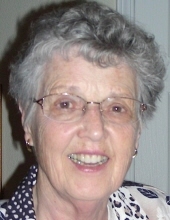 Alice M. Beaton, age 88, died on Sunday, April 14, 2019. A longtime resident of Colorado Springs, Alice was born in Chicopee, Massachusetts on May 8, 1930 to James E. and Eleanor M. (Murphy) Kirwan. She graduated from Holyoke High School in 1947 and went to work as a secretary for an insurance company. In 1952 she married Arthur Peter Beaton. Alice was a longtime member of the Broadmoor Community Church. She served her church as a member of the Building and Grounds Committee. She was also a member of Women’s Fellowship where she was in charge of memorial services for many years. Alice was a member of the Order of the Eastern Star, located in O'Fallon, Illinois. Alice’s parents; sister, Betty (Kirwan) Zimmerman; and husband preceded her in death. She is survived by her four children, Mark (Paula Weiss) Beaton, Gail (Sherrie Langston) Beaton, Glenn (Christina) Beaton and Stuart (Sheryl) Beaton; six grandchildren, Brian Beaton, Anna Beaton, Alice (Jonathan) Lloyd, Caroline Beaton, Matt (Lauren) Beaton and Abbey Beaton; her cousin, Marjorie Burke; and numerous beloved nieces and nephews. Memorial Service, 1:00PM, Tuesday, April 23, 2019, Broadmoor Community Church, 315 Lake Avenue, Colorado Springs, Colorado 80906. In lieu of flowers, the family requests memorial contributions in Alice's memory be made to the Broadmoor Community Church or to a charity of one’s choice. To send flowers or a remembrance gift to the family of Alice Marilan Beaton, please visit our Tribute Store. Guaranteed delivery before Alice's memorial service begins. "Email Address" would like to share the life celebration of Alice Marilan Beaton. Click on the "link" to go to share a favorite memory or leave a condolence message for the family.